At 10am we kick off our organised play events. Godtear is already having a huge year in 2018, and it’s hard to believe it was right here at SteamCon UK in 2016 that the game’s first teaser images were released to the public. We’re setting aside time each day for Godtear events as well as plenty of room for Godtear open play. The events are currently just marked as ‘X Godtear Event’ in the schedule, but rest assured that there will be plenty of opportunities for Early Access players to throw down with their favourite warband as well as for players new to Godtear to take this exciting new miniatures game out for a spin. As we get closer to SteamCon UK, we will give updates on all of the ‘X events’ as well as additional information on a number of introductory formats ranging from traditional demos to full game intros and even a look into the scenario and campaign system. We look forward to seeing you there and hope that you are able to claim the power of the gods for your own! Are there games in the Steamforged library that you haven’t tried yet? We’ve already mentioned that there will be plenty of opportunity to have a demo of Godtear, but there will also be demos available for the hugely popular Dark Souls™: The Card Game as well as Resident Evil™ 2 - The Board Game. Alternatively, if you’re already a fan of all our other games, come and ask us for a demo of Guild Ball! At about midday we’ll start our seminars. SteamCon seminars have become a fan favourite so we’ve secured a much larger space for our seminars than we have in previous years. We don’t have final details on what the seminar schedule will be for this year, but you should expect to see the return of fan favourites such as the ‘design a model’ series as well as a variety of background-based seminars with SFG Lead Writer Sherwin Matthews. After a hard day of having fun, we all get to relax at the SteamyCon Mixer. This is a fantastic opportunity to get some face to face time with the Steamforged staff, including the developers of your favourite games. In previous years we’ve also given away a set of limited edition Guild Ball stat cards to each person at the mixer, I wonder what the cool swag could be this time? Godtear events and organised play will be available once again, in the same manner as Friday; as will our selection of challenge and demo tables. At 10am the top 8 of the Guild Ball LCQ will battle it out to see who will be the final person to join the Guild Ball World Finals on Sunday. But we’ll also be spinning up a number of other Guild Ball events to keep everyone else entertained, including a 32-player British Championship Qualifier for those looking for competitive gaming. Alternatively for those looking for something completely off the wall, the cult favourite Snake Draft format will be returning to SteamCon UK. In a Snake Draft, before the event starts each player must draft a team chosen from the entire selection of Guild Ball models! Alternatively, do what many people did last year, and just play pick-up games in our Rookie League. 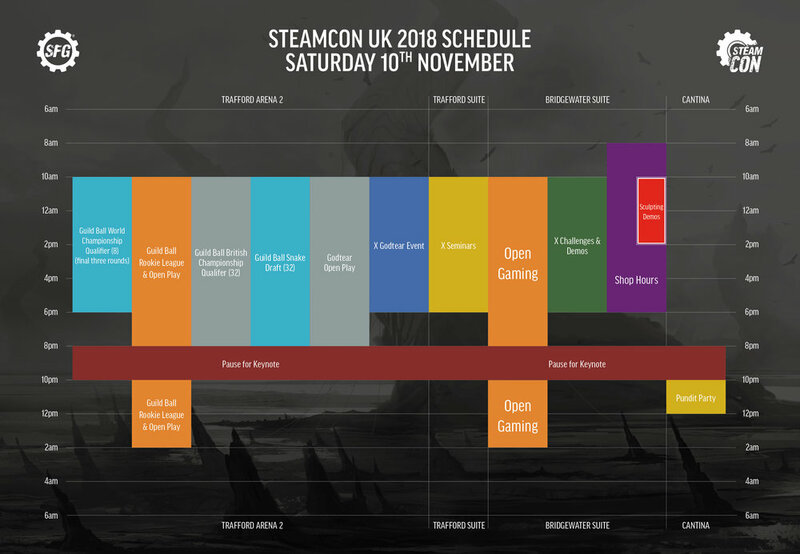 In the evening of Saturday, everyone will be gathered into the main gaming hall (Trafford Arena 2) to witness the spectacle that is the Steamforged Games Keynote & Staff Q&A. If you’re at all interested in anything Steamforged is doing over the next year (and of course you are, you’re at SteamCon! ), come along and see what we have planned for the future. We’ll even be pausing all other events so that no one has to miss out! The Pundit volunteer scheme is incredibly important to us. Pundits are our ‘people on the ground’ helping to drive community interest and engagement as well as running countless demos and events. At SteamCon we love running our Pundit Party after the Q&A to show our appreciation for this fantastic group of people. This time, it takes place in the Star Wars cantina! Godtear events and organised play will once again be available in the same manner as Friday & Saturday, as will our selection of challenge and demo tables. At 8am the 2018 Guild Ball World Championship Finals get underway. 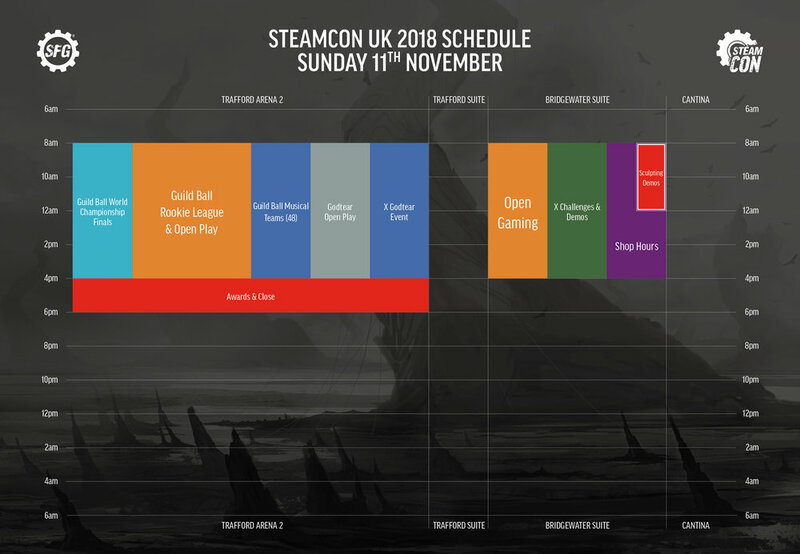 If you are unable to attend SteamCon UK make sure to tune into our livestreamed coverage of the event, it’s sure to be a nail biter! For everyone else looking to play Guild Ball, the Rookie League will still be open as will general open play. However, we’ll also be running another cult favourite event, the Musical Teams where at the end of each turn each player will move down to their next table and pilot their teammate’s models! Once all events have concluded, we’ll gather everyone together once again just to say thank you for supporting Steamforged Games and SteamCon UK. After that it will be time to say goodbye for another year and the countdown until next SteamCon begins. That’s all for now folks, stay tuned for more updates on SteamCon UK as we get closer to the weekend of the convention. For our North American based fans, you can expect to see an announcement about SteamCon US, including details of ticket sales, next week!